John Caius (1510–1573), second founder of Gonville and Caius College, Cambridge, was an English scholar with an international reputation in his lifetime as a naturalist, historian and medical writer. His Autobibliography is a major contribution to the history of English culture in the middle years of the sixteenth century and has been translated into English for the first time in this book. 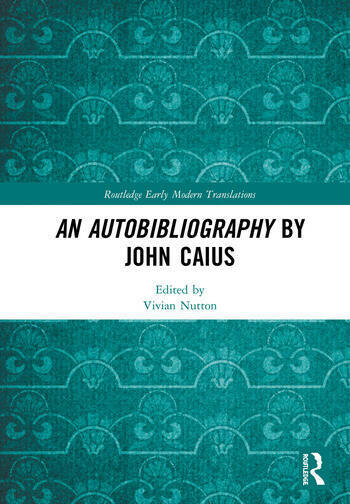 Beginning with an in-depth introduction to John Caius’ life and works, An Autobibliography by John Caius provides a wealth of information to support and accompany the translation of this significant text. In his Autobibliography, Caius lists the books that he wrote but also details the circumstances of their writing. He describes his travels in Italy in search of manuscripts of the ancient Greek doctor Galen of Pergamum as well as giving an insight into his personal life, including his vigorously conservative views, whether on medicine, spelling and pronunciation, or on Cambridge University. His religious views, which led to the ransacking of his rooms by a Cambridge mob, are explored in detail in Appendix II of this book. In Appendix I, recent discoveries of books owned and annotated by Caius are used to supplement what he says about his activities, as well as to trace at least one of his lost works in Italy and Denmark. The resulting picture throws light on European medicine in the sixteenth century, as well as on the humanistic culture that linked learned men and women across Renaissance Europe. Vivian Nutton is Professor of the History of Medicine, I.M. Sechenov First Moscow State Medical University, and Emeritus Professor of the History of Medicine, University College London. Among his recent books are a translation of Galen, On Distress (2013), Ancient Medicine, 2ed (2013), and a translation of Johann Guinter and Andreas Vesalius, Principles of Anatomy according to the Opinion of Galen (2017).